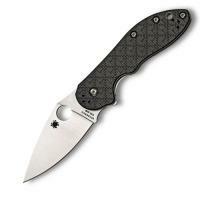 Spyderco C172CFTIP C172CFTIP Domino Plain Edge Folding Knife FREE SHIPPING! The Domino is a premier plain-edge folding knife produced by Spyderco. Designed by Eric Glesser, it features an unique ergonomic handle and is the company's second model to include the Kit Carson-inspired flipper tech that is perfectly positioned to provide excellent leverage and provide a highly reliable - and smooth - release. The premium CTS XHP steel blade has been flat-ground and relies on ball bearing washers to give one of the smoothest opening actions around. It has a steel Reeve Integral Lock (RIL) mechanism that also doubles as an overtravel stop. The textured handle is made of solid titanium scales on one side and combination of Cubic Check Carbon Fiber Laminate with a titanium liner on the other. It also has a four-position pocket clip (black) so you can carry it up or down. It's easy to clean and has a pocket-friendly profile and weight at only 4.55 inches (116 mm) when closed and weighing only 4.2 ounces (119 g). ©2002-2019 CopsPlus.com: Spyderco C172CFTIP C172CFTIP Domino Plain Edge Folding Knife FREE SHIPPING!